Last round will be “called” 20 minutes before closing time. It would therefore be expected that members would finish their drinks by the scheduled closing time. Members must vacate the premises 15 minutes after closing time. 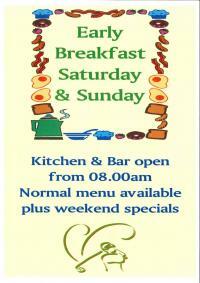 We ask that members assist us and co-operate with the bar staff on duty. Unfortunately, due to recent supplier increases in both the bar and the kitchen, the Management Committee has no alternative but to increase the bar and food menu prices accordingly, with effect from 1 APRIL 2017. A night not to be missed, click HERE for more information. A call to arms - players are required for the two club teams participating in the Bridport Bowl Competition. This competition replaces that formerly known as the Carpet Barn which ceased last year. It is essentially the same format, being for teams of ten playing five better ball match play matches against an opposing club to win through to the next round. All players should be 50 or older by 1st April 2017. If you are interested in playing please add you name to the list on the Competitions notice board. 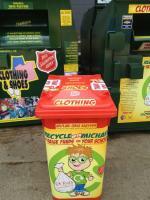 Two bins have been acquired from the Salvation Army for the recycling of old clothing. The bins have been placed in front of the trolley store. All proceeds derived from this project will accrue to the golf club. “Ready golf” is not appropriate in match play due to the strategy involved between opponents and the need to have a set method for determining which player plays first. However, in stroke play formats, it is only the act of agreeing to play out of turn to give one of the players an advantage that is prohibited. On this basis, it is permissible for administrators to encourage “ready golf” in stroke play, and there is strong evidence to suggest that playing “ready golf” does improve the pace of play. For example, in a survey of Australian golf clubs conducted by Golf Australia, 94% of clubs that had promoted “ready golf” to their members enjoyed some degree of success in improving pace of play, with 25% stating that they had achieved 'satisfying success'. (R&A pace of play manual). Ready Golf means BEING READY to play…. not playing when you're ready. Here are some simple reminders. Walk to your ball as soon as possible, so that you can choose your club and think about the shot in ADVANCE, do not wait until it’s your turn to begin this process. When a ball is lost, hit your shot FIRST and then go help look for the lost ball. Walk down the SIDES of the fairway to reach your ball and then APPROACH it from the side. NEVER play in a caravan, moving in a group from ball to ball. When on the Green, line up your putt BEFORE it is your turn, and putt out short putts immediately instead of marking, if you are not on someone else's line. Ready Golf DOES NOT mean RUSHING. If you prepare in advance, you can take your time AND play Ready Golf. If every person in a four ball could play each hole just 25 seconds quicker, then we will make up half an hour for each round.